If and only if ‘the power of a flower can shower one forever’ with enormous benefits for the skin, then it cannot be anything less than Calendula, the one and only ‘on the dot’ flower that blooms probably on the first of the calendar month. 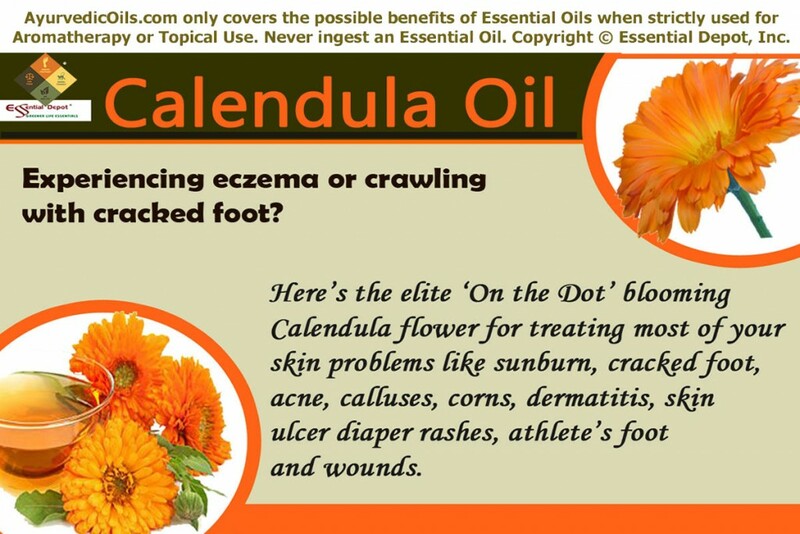 Calendula and its oil has always been one among the best natural aid for treating numerous skin problems ranging from eczema to cracked foot. While it looks resemble Marigold, this magical Pot Marigold called as Zergul in Hindi and Chin Chan Ts’ao in TCM (Traditional Chinese Medicine) has been used in Ayurveda and other Complementary and Alternative Medicinal practices for treating wounds, insect bites, sunburns, vaginal infections, varicose veins, acne, warts, calluses, scabies, corns, gastritis and conjunctivitis. Lovingly called as ‘pot marigold’, Calendula officinalis is an arm of the daisy family, Asteraceae. Indigenous to southwest Asia and West Europe including the Mediterranean and Macaronesia, Calendula is also called as Garden marigold and Scottish marigold. There are many misunderstanding facts between other Calendula and Marigold varieties like marsh marigold, corn marigold and desert marigold that belong to the Tagetes genus and not the Calendula genus. Calendula oil is said to possess antiseptic, antioxidant, anti-inflammatory, stimulant, detoxifying, carminative, anti-tumor, anti-hemorrhagic, antiviral, antifungal, anti-HIV, hepatoprotective and emmenagogue properties. Ayurveda is not associated only with the word ‘remedy’ and much more than that, it encompasses diagnosis of the root cause of an illness, prevention of diseases, healthy aging and longevity to love and live with nature, naturally. Loved as the most precious gift of the God of Creation, Brahma to the Lord of Medicine, Acharya Dhanvantari, Ayurveda is in healing and harmonizing mankind for more than 5,000 years, for which it is called as the Mother of all healing methodologies on earth. This includes Unani, Siddha, Homeopathy, Chiropractic, Aromatherapy, Allopathy, TCM or the Traditional Chinese Medicine, Acupuncture and Naturopathy. Ayurveda is held high in India and all over the world for its holistic healing practices that defines health as the wellness of the mind, body and spirit together. Among the 4 sacred books of the Indian Hindu mythology (Rig, Yajur, Sama and Atharvaveda), Ayurveda is a significant part of the Atharvaveda, where 114 verses talk about various health conditions, its symptoms, natural remedies and various Ayurvedic techniques for prevention and increased life span. Dinacharya or the Ayurvedic routine recommends numerous ways for leading a hale, hearty and disciplined life. Human body is regarded as a temple, where the soul dwelling in is considered as a divine presence. This school of thought enables Ayurveda to strongly recommend practices for keeping the body, mind and spirit clean and cheerful. Everything in this world is a part of nature and is made up of the fundamental elements, namely earth, water, fire, air and space. Every person is made up of a unique combination of these five elements, precisely called as doshas (vata, pitta and kapha). Vata (air + space), pitta (fire + water) and kapha (water + earth) make up an individual constitution, which is also called as Prakriti. Each and every individual has a unique Prakriti just like the fingerprints, with a predominance of any of these three doshas. This doshic predominance determines the character, personality, behavioral patterns and emotional setup of an individual. Perfect balance between doshas as per the law of nature indicates health and doshic imbalances due to sedentary lifestyle, change in food habits, weather fluctuations etc., lead to sickness. Ayurvedic remedies aim at treating the root cause of a health condition and prescribes unique medication for every person as per the Prakriti or the individual constitution. The major Ayurvedic remedies include Ayurvedic essential oils, yoga, simple physical exercises, meditation, herbs, Pranayama (the art of balanced breathing), Abhyanga or the Ayurvedic massaging technique, Dinacharya or the Ayurvedic routine and Panchakarma (the Ayurvedic detoxification therapy). Calendula oil is recommended for pacifying pitta and kapha doshas and for augmenting vata energy. As we saw above, it’s historical significance during the World War I and the American Civil War as an excellent first aid agent in healing wounds, arresting bleeding and in treating inflammatory conditions is a noble proof for its brilliance in wound healing and is called as ropana in Ayurveda, means one which heals wounds. A 2008 study on ‘Calendula officinalis and Wound Healing: A Systematic Review’ by Matthew J. Leach, PhD, BN (Hons), ND, RN, MATMS, published in WOUNDS, A compendium of clinical research and practice substantiates that the presence of triterpenoids like faradiol and the faradiol monoester and other components including flavonoids, saponins, polysaccharides and micronutrients contribute to its anti-inflammatory, anti-edematous, wound healing attributes and antioxidant properties. The major skin conditions considered for this study includes foot ulcer, dermatitis, varicose ulcer, burns, injuries, cuts, abrasions, pressure ulcer, skin ulcer and other wounds. This study also explains that Calendula officinalis has “Anti-inflammatory activity – The acute inflammatory response during the early stages of injury generates factors that are essential for tissue growth and repair. Antimicrobial activity -Wound healing can also be delayed when microorganisms are present in large enough numbers. Therefore, reducing the bacterial load of a wound may be necessary to facilitate wound healing, as well as reduce local inflammation and tissue destruction. An ideal agent for the prevention and control of wound infection would therefore be one that directly destroys pathogens, while also stimulating immune activity. Calendula is one agent that possesses both of these properties. Antioxidant effect – The production of free radicals at or around the wound bed may contribute to delays in wound healing through the destruction of lipids, proteins, collagen, proteoglycan, and hyaluronic acid. Agents that demonstrate significant antioxidant activity may, therefore, preserve viable tissue and facilitate wound healing. Calendula demonstrates free radical scavenging activity against superoxide radicals and hydroxyl radicals and facilitates wound healing via an important antioxidant effect. Wound healing activity – The most important clinical endpoint in wound management is wound closure or 100% epithelialization. Given that wound closure is critically important; it is argued that any agent demonstrating significant wound-healing activity should be seriously considered in conventional practice. With its immunostimulant, astringent, anti-inflammatory, antifungal, antiviral, anti-microbial, antiseptic and disinfectant properties, applying a blend of 5 drops of Calendula with 2 drops of Bay leaf oil in your mild skin care cream or with 10 drops of Coconut oil can help in healing bee stings, insect bites, sores, cuts, bruises, skin abrasions, swelling, burns, acne, scrapes, diaper rashes, athlete’s foot, conjunctivitis, dermatitis and other inflammatory skin conditions. The most adorable quality of Calendula oil is that it helps in controlling the formation of scars and diminishes stretch marks with its ability to stimulate tissue repair generation and secretion of collagen that enhances the natural elasticity of skin cells. You can also add few drops of Calendula oil in your skin care ointments, lotions and creams or in salves, facial steams, baths, washes, tinctures and Ayurvedic essential oils for nourishing, enriching and nurturing the texture and health of your skin. Calendula oil has diuretic and anti-inflammatory properties that assist in clearing away excess of kapha dosha responsible for fluid retention through the mutravahasrotas, means the urinary passages by promoting the frequency and quantity of urination. By this way, the excess water deposits, toxic remains, salt, uric acid and fat in the system are eliminated through urine. 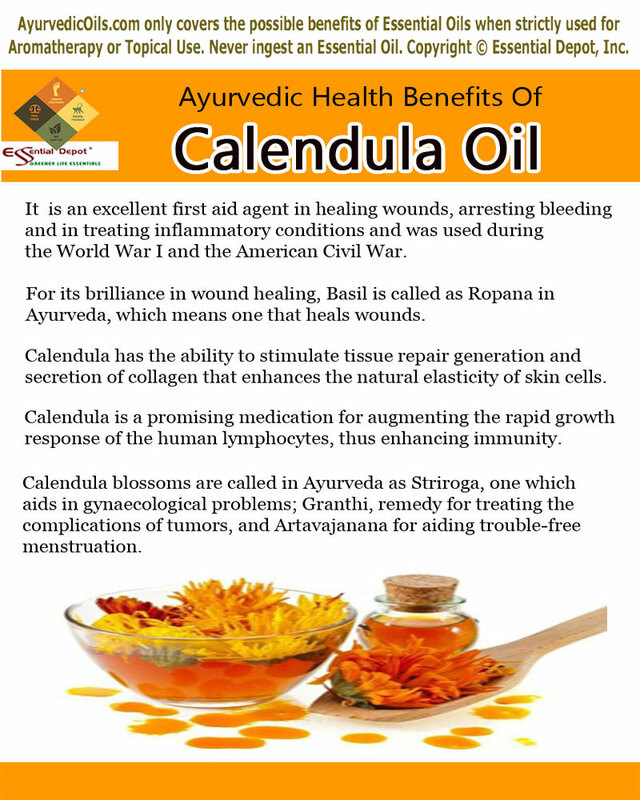 The effectiveness of Calendula in enhancing the functions of rasa and rakta dhatus, which means the plasma and blood tissues contributes to its ability in augmenting proper blood circulation. This makes Calendula oil as a promising remedy in treating circulatory conditions like varicose veins, arthritis, gout and rheumatic conditions. Thus massaging the affected or painful parts with 1 ounce of Calendula oil with 2 drops of Cassia oil and 2 drops of Black cumin oil can help in enhancing blood circulation, discarding toxic remains and fluid retention through urine and reduce pain and inflammation associated with rheumatism, varicose veins, gout and arthritis. You can also add 2 drops of Calendula oil in warm water and use it is a gargle for alleviating sore throat, killing germs and microbes in the mouth causing bad breath, cavities, gingivitis and other gum problems. Low immune power is the direct doorway for numerous microbes, pathogens and other micro-organisms causing various diseases and contagious medical conditions. The presence of calendulin, a yellow resin along with tannins and other chemical constituents of its volatile oil makes Calendula a promising medication for augmenting the rapid growth response of the human lymphocytes. WBC or the white blood corpuscles are responsible for the body’s immune power or the potent to fight against pathogens, microbes or other harmful micro-organisms invading the healthy system. With its anti-microbial, antifungal, antiviral and antibacterial properties, Calendula oil strengthens the immune system by shielding against the attack of bacteria, virus, fungi, worms etc. Calendula oil also helps in treating inflamed lymph glands and decrease lymphatic congestion. It also aids in purging away harmful toxic remains in the body through urine with its triterpenoid components responsible for its anti-inflammatory and diuretic properties. Adding 5 drops of Calendula oil in bathing water every morning and 2 drops of Calendula oil added to your hankie or your pillow cover are the best ways to strengthen your immunity through the ‘Calendula power’. Calendula oil boasts its support to various digestive functions with its astringent, anti-inflammatory, anthelmintic and antimicrobial properties. The ability to pacify excess of pitta energy or digestive fire makes Calendula an excellent natural remedy for soothing the lining of the stomach, intestines and the gastrointestinal tract. Massaging your abdomen with 10 drops of Calendula oil blended with 2 drops of Calamus oil and 4 ounce of Coconut oil can help in soothing the walls of the stomach and intestines, thus pacifying irritable bowel syndrome, peptic ulcer, gastritis and other inflammatory conditions of the gastrointestinal tract. This medicated massage can also assist in stimulating the functions of the liver, the organ of detoxification, thus support in eliminating microbial infections, ama or toxic remains in the stomach, intestinal worms and other pathogenic foreign bodies in the gut, which may otherwise lead to dysentery, viral hepatitis, diarrhea and enteritis. Calendula is extremely beneficial in supporting the functions of the female reproductive problems including irregular menstruation, uterine fibroids, frigidity and ovarian cysts (polycystic ovarian syndrome). For all these special benefits, Calendula blossoms are called in Ayurveda as Striroga, one which aids in gynaecological problems; Granthi, remedy for treating the complications of tumors, and Artavajanana for aiding trouble-free menstruation. The oil of Calendula helps in clearing excess of kapha and pitta energies in the uterus, mainly because of its effectiveness on artavavahasrotas. A gentle massage of the lower abdomen, back and thighs with 10 drops of Calendula oil and 1 drop of Cinnamon oil and 1 drop of Cassia oil can help in promoting blood circulation in the uterus, regularizing blocked or delayed menstruation, relieving dysmennorhea or menstrual pain. You can also use this blend in bath, especially during your menstrual cycle and the times you’re sick with menopausal symptoms. Calendula oil functions like a tonic to the uterine muscles, aiding in balancing the estrogen hormones that are responsible for PCOS and uterine fibroids. It is also trusted to treat cysts in the digestive passage and the breasts. Calendula infusions were used in folklore remedy for fostering uterine contractions and the discharge of placenta during childbirth. The most celebrated herbalists, Gerard and Culpeper call Marigold as a “comforter of the heart and spirits”. Calendula is also recommended safe for diaper rashes, hemorrhoids, stomach upset, people undergoing radiation therapy, abdominal cramps, fistulas, sprains and eye inflammation. This information is only for the use of education and is not intended to diagnose or prevent any health condition or to substitute any prescription drugs or professional medical advice. We, the Essential Depot team are not healthcare professionals and this content is written only in social interest of educating the public about the richness of Ayurvedic treatment, the most trusted traditional healing system. Calendula oil is suggested only for the use of topical application and do not take it internally. Talk with your medical expert or your Ayurvedic practitioner before choosing the appropriate Ayurvedic oils for your Prakriti or unique individual constitution and medical condition and before using them on children, nursing women, pregnant ladies and on people who are undergoing other treatments (please check on drug interactions) and on those who are allergic to specific oils. This entry was posted in Essential Oils - Learn About and Purchase and tagged 5 Ayurvedic uses of Calendula oil, Ayurvedic oils for acne, Ayurvedic oils for aging symptoms, Ayurvedic oils for diaper rashes, Ayurvedic oils for dysentery, Ayurvedic oils for immune power, Ayurvedic oils for menopausal symptoms, Ayurvedic oils for menstrual problems, Ayurvedic oils for PCOS, Ayurvedic oils for rheumatism, Ayurvedic oils for ulcer, Ayurvedic oils for uterine fibroids, Ayurvedic oils for wounds, Ayurvedic oils for wrinkles, Ayurvedic uses of Calendula oil, Calendula and Ayurveda, Calendula in Ayurveda, Calendula officinalis, Calendula oil and Ayurveda, Calendula oil in Ayurveda, Chemical constituents of Calendula Oil, Health benefits of Calendula oil, History of Calendula, Therapeutic properties of Calendula oil, Top 5 health benefits of Calendula oil by AyurvedicOils. Bookmark the permalink.